Red short-sleeved shirt with white cuffs. Large embroidered emblem on left breast. Embroidered red star above the emblem. Lower-case 'v' in white, below the emblem. A white scroll, outlined in blue, below the 'v', with the opponent's name in capitalised blue lettering within it, and the year in white below the scroll. Two embroidered white concentric diamonds on right breast. Plain white number on reverse and on right breast, below diamonds, in same font as on previous white shirt and with a mesh panel running down through the number. Surname in capitalised white lettering above number on reverse, in same font as the numbers. White shorts, with red drawstring and red seams sloping down to the rear. Plain red number on left thigh in same font as on shirt, with two red concentric diamonds underneath. Red emblem on right thigh. Plain red socks, with white footings from ankles downwards. 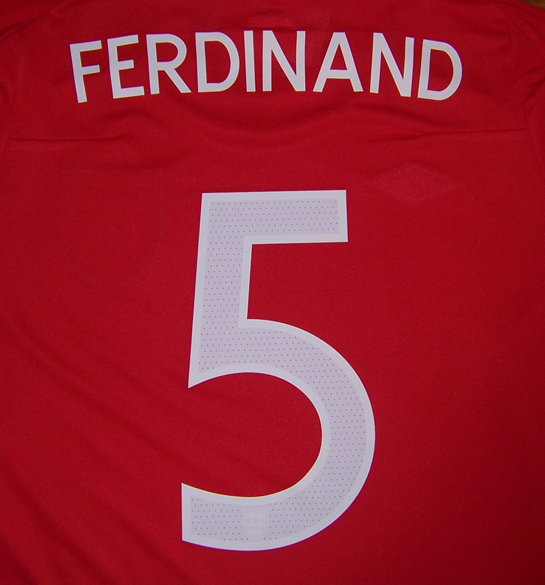 In the first two games in which this shirt was worn, England's captain wore a white armband with the emblem, a lower-case 'v' (in red against Egypt and in blue against Japan), below the emblem, a white scroll, outlined in blue, below the 'v', with the opponent's name in capitalised blue lettering within it and the year (in red against Egypt and in blue against Japan), below the scroll. The armbands worn in the World Cup by Steven Gerrard featured the FIFA MY GAME IS FAIR PLAY logo. For the game against Japan, the shirt worn by Glen Johnson also included his first initial i.e. G. JOHNSON. For the two World Cup Finals tournament fixtures, England had the SOUTH AFRICA 2010 WORLD CUP logo embroidered onto the upper right sleeve. The names of England's opponents, as they appeared in the scrolls, were EGYPT, GERMANY, JAPAN and SLOVENIA. The 'v' and the year were in blue for the two games played in the World Cup finals tournament. 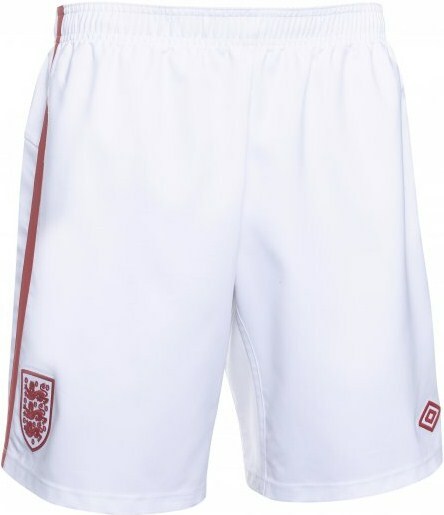 England wore an alternative pair of red shorts for the two games played in the World Cup finals tournament, with a red drawstring, white seams sloping down to the rear, a plain white number on the left thigh in the same font as on the shirt, with two white concentric diamonds underneath and a white emblem on the right thigh. 24 players wore this shirt, plus a final appearance on the bench by David Beckham for the game against Egypt. Terry was the only player to complete the full 360 minutes in which this shirt was worn. 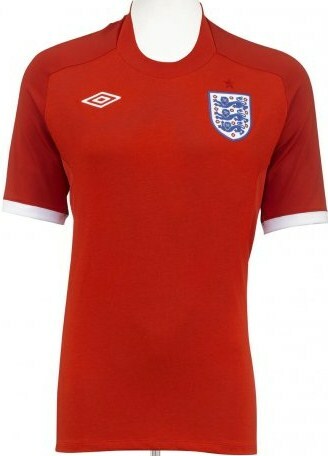 Leighton Baines was the only player to make his international debut in this shirt. 5 players made their last international appearance in this shirt, with Emile Heskey winning his 62nd cap as a substitute against Germany, and Joe Cole gaining his 56th cap on leaving the same bench as Heskey, seven minutes earlier. All four England scorers had netted for their country before. The own goals were both scored by Japanese central defenders (Tanaka and Nakazawa). Upson's goal was on his 21st and last appearance for England, despite it briefly giving his country hope that they could come back against Germany in the World Cup. Wright-Phillips also scored his last international goal in the shirt. It was his sixth. Gerrard was Ferdinand's deputy when Capello's choice for the World Cup captaincy ended with injury. 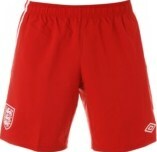 A short-lived change kit for England, possibly due to their heaviest ever World Cup defeat, football superstition being what it is. The second in the 'Tailored by England' range, it was launched using David Beckham, amongst others modelling it. However, Beckham only wore it to warm the Wembley bench in it, on its first appearance. Its unveiling came on 8 February, 2010, when Tom Meighan, lead singer of Leicester rock band, Kasabian appeared in it for an encore at the Olympia Theatre, Paris. This rather unusual introduction was explained by Umbro as 'redefining how people see the Englishman abroad'. Its impact on Kasabian's French fans is unknown. It proved to be fairly popular, until the one disastrous performance in it, against Germany. For the World Cup, the alternative red shorts turned it into an all-red kit, which made perfect sense against Slovenia's all white, but less so against Germany's black shorts. England's next change kit was a radical galaxy blue, whilst red shirts did not appear again for another three years, finally proving that tradition always trumps recent embarrassments. England wore the all-red kit, against Slovenia. England wore the all-red kit, against Germany.